My hen Snapdragon is at least part Sumatra. This makes her a bit wary, not as social as our other hens. She hangs back from the flock, keeps her distance, doesn’t like being petted or fussed over like the others. Sumatra hens tend to lay fewer eggs, one every 3 days or so. In Snapdragon’s case, we have gotten only one egg per week, sometimes less. John and I have joked about how there is a pile of 50 eggs somewhere on this land. The other day, Rory Gallagher (the crazy kitten) was stalking Snapdragon for sport. He never hurts her, but he likes to practice hunting with Snapdragon, since she is a loner. He’ll creep along behind her and make a rush, only to swerve away at the last second. Anyway, Rory Gallagher was on her trail. She tolerates him. Snapdragon ducked into the dense brush at the edge of our yard. Rory Gallagher followed. So did I. I trust Rory most of the time, but he looked a little too serious that day, so I wanted to intervene if necessary. Rory made his little rush and then lost interest. I decided follow Snapdragon anyway. 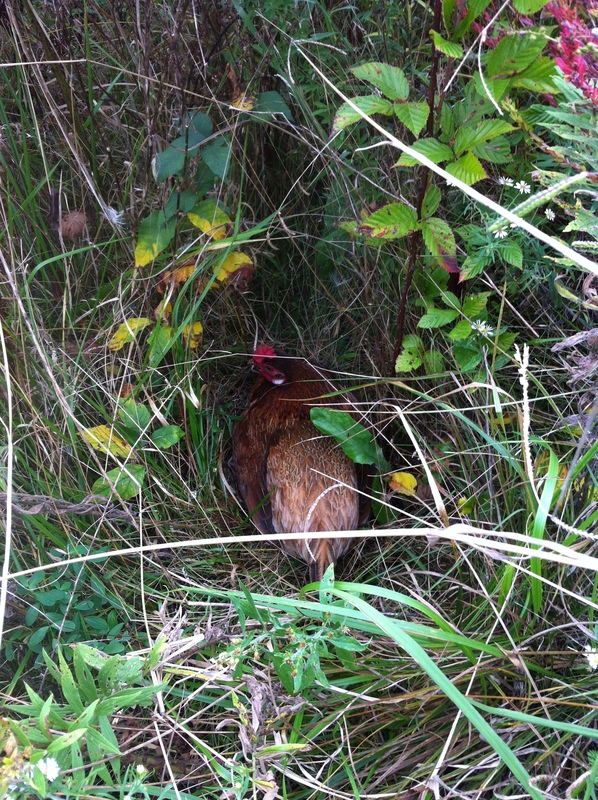 When I caught up with her, she was spread out flat, down in the grasses. At first I thought she was hurt. I picked her up to inspect her. 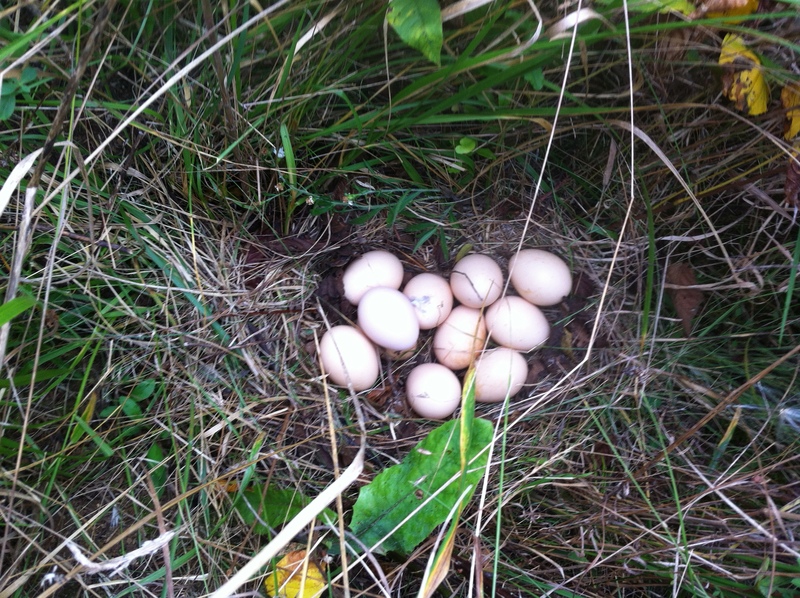 Under her were eleven perfect eggs, one pressed into the mud underneath the 10 eggs in this picture. I took Snapdragon out into the lawn and let her go. I collected 9 of the eggs. I left her a couple to sit on, hoping it would encourage to lay in the nest every day. I decided to do the “float test” to make sure these eggs were still good. I put cold water in a bowl, and dropped the eggs in one at a time. One by one they sank, which meant they were good. When they float, it means they’re old. Sure enough, each day for the rest of that week, Snapdragon laid an egg in the nest. The two I had left behind were muddy, so each day I took the clean egg. Some days they were warm from her body. After a week I decided she had the hang of it and liked that nest, so I decided to take all three eggs. OH SNAP!! She hasn’t laid in the coop or that nest since! Where’s Rory Gallagher when you need him? Sister, put them back! Once in a while they will go back to the same place. If she sees eggs there, it will encourage her.